I had imagined reviewing the Big Ears Festival last Tuesday after arriving back home from traveling to it, but the death of Scott Walker meant that I had to address that event first. To say nothing of the death the next day of The Beat’s Ranking Roger [which, technically, I just mentioned]. The festival is an easy two hours drive from where I live, so it’s not an onerous thing to attend. 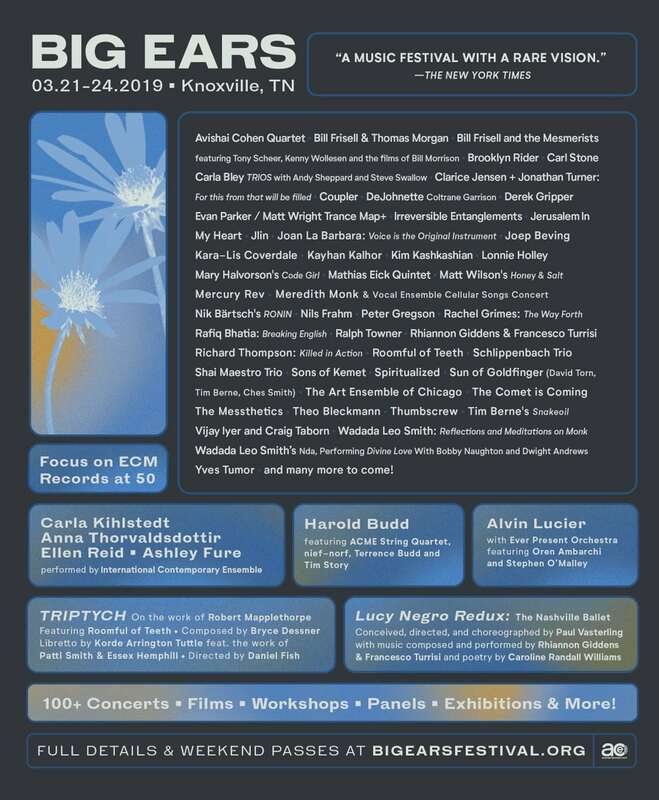 Knoxville is the next big city to the west and it’s many times the size of sleepy Asheville, but even as this was the third Big Ears we have attended so far, the event seems to be stretching Knoxville to its limits. I can imagine events playing at the civic center there eventually. Lots of shows reached capacity, and many of the people I spoke with were definitely opting for VIP passes the next time they went. I could barely afford the $250 general admission passes for my wife and I. Since we are usually attending for a single artist, I could never justify that sort of outlay. Premiere was $375 and jumped you in the line ahead of general admission. VIP guaranteed admission to any event up until 15 minutes prior but was a staggering $650/head. I can’t play that game. Friday started off slowly for us. The trip to Knoxville took just two hours and we started at the Art Museum by the early afternoon. This was not a performance per se. It was an 8-channel installation in the Knoxville Museum of Art and was out first stop. We listened to it while taking in the art in the gallery of the museum. It was not quite the same thing as hearing Roedelius actually play the piano, but we’d actually see Tim Story later in the festival. We then made our way across town to catch some of Beatrice Gibson’s experimental films playing in the University of Tennessee Downtown Gallery. We had plenty of time to take in several hours of these before the first concert we were planning on attending. We sat down at what was the end of one film and another began within a minute or two. The result did not inspire. It really felt like I was watching an SCTV parody of an “art film” and that Catherine O’Hara would be walking across the moors in a black and white print poncho at any moment as Eugene Levy showed up in the mis en scene to whinny like a horse. Having seen one 10-12 minute film, we took our leave. It was time for some food. Cellist Peter Gregson was playing in the St. James. Episcopal Church across town from 6-7 so we were actually seeing some performance this time after our “soft landing” at the festival. 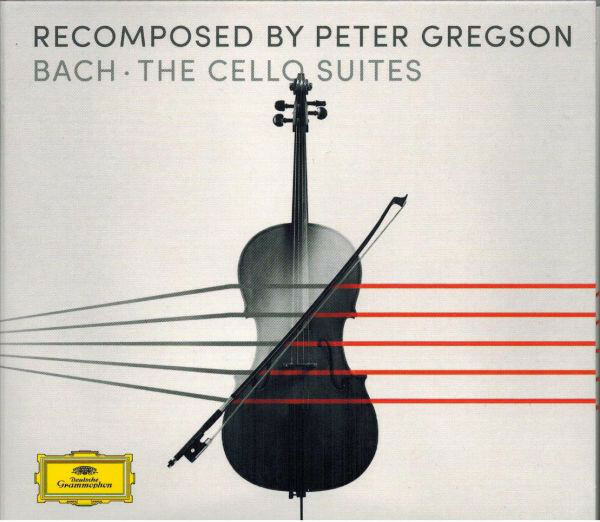 Gregson had re-examined the Bach Cello Suites with an eye for exploding some of the details embedded within them into brief compositions re-arranged to spotlight them. 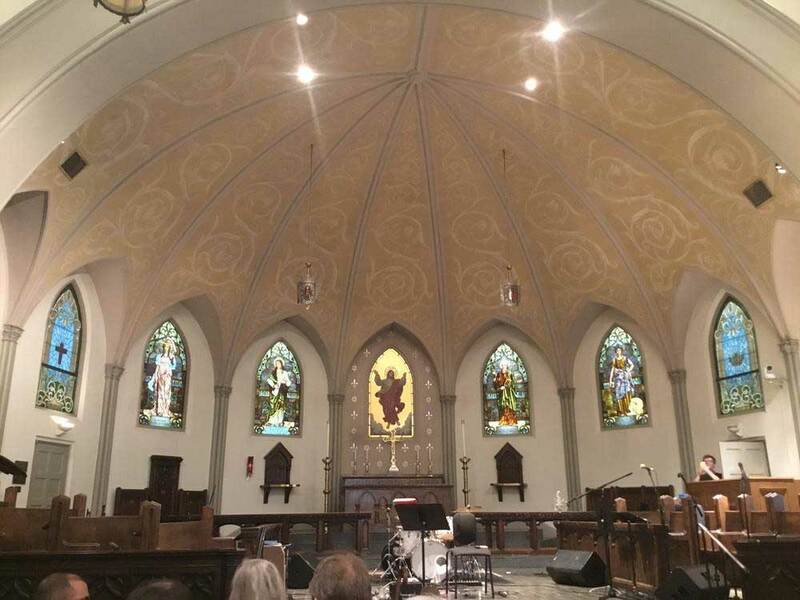 Acoustics in the church were fantastic, as one can see from the dome of the cathedral as shown above. Gregson did play along with playback since he did not have side players and of course his synth lines were also canned here. This is the first time I’ve seen any classical performer do this and it means that a line in the sand has been crossed. I get it with pop music, but to rely on playback with classical works seems to be troubling as it is a more purist art form. At any rate, the performance was interesting and it allowed hearing these standards of the cello canon in new ways. This was the “A-Ticket” item of the first day. 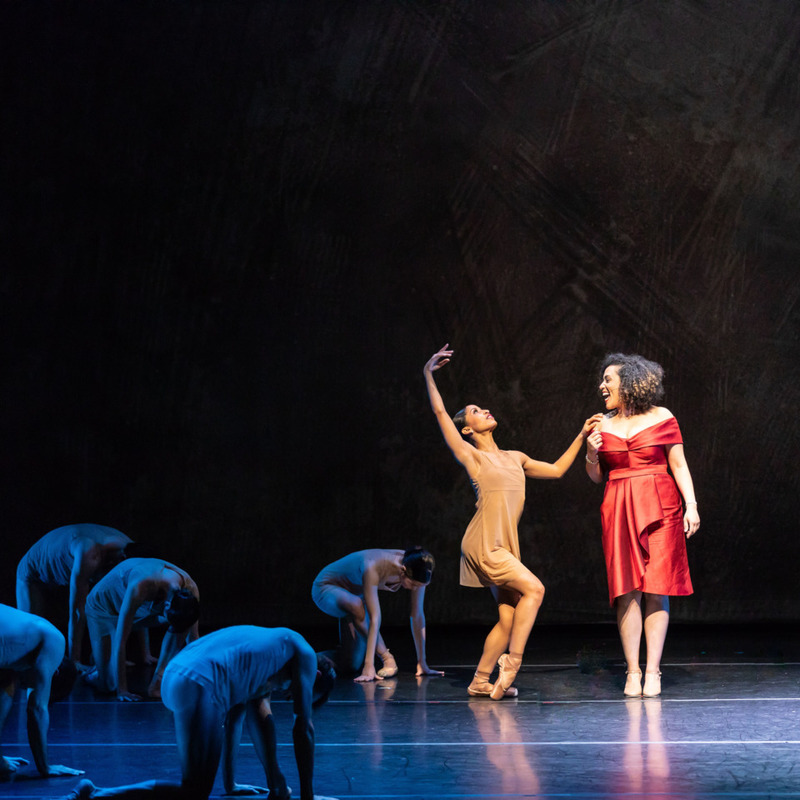 The Nashville Ballet’s new work was being performed for the third time this evening; having premiered in Nashville in February with its second performance occurring the previous night. This show was the one that was under the aegis of the Big Ears Festival so anyone attending could get in to see it. And it was a dazzling show. An interdisciplinary modern ballet that incorporated poet Caroline Randall Williams [above in red] who wrote the book of poetry that inspired it into the staging itself. The live music was performed by singer/banjo player/violinist Rhiannon Giddens and pianist and percussionist Francesco Turrisi. We love ballet and the music here was vying with the poetry of Ms. Williams equally for our attention. Ms. Giddens [of the Carolina Chocolate Drops] sang like an angel this evening. We seriously erred in leaving the show early in order to get across town in time for the Altered Statesman show at 10:00 p.m. The Pilot Light; a dive bar in the Old City area of town. I’ll admit that when sampling Altered Statesman, they sounded pretty good to my ears and I was looking forward to hearing more of them. But we got there and crammed into the tiny club and got up front. They began playing, and my wife began to retreat. We moved half way back from the stage. Then, everyone moving within the club was only moving directly in front of us. Never a fun thing, and after three numbers my wife had heard enough. “Has beens,” she decreed as we left The Pilot Light and walked to the nearby Mill + Mine to get ready for Mercury Rev. This entry was posted in Concert Review and tagged 2019, Big Ears. Bookmark the permalink. I’m intrigued by your comment on Mercury Rev, so I’ll wait to see how this pans out, but I’m sorry you had to miss that show. It sounds like a wonderfully diverse program of music well outside the normal focus of this blog … but I’m both really interested to hear about the artists you liked, and I’m still just gobsmacked at the notion that a concert promoter would use some of the profits of a more mainstream festival to “give back” by giving stages and spotlights to more obscure but notable artists in such a wide array of genres, helping them find new audiences and providing rare opportunities to see them in concert. What a wonderful and generous idea, and one I wish would “afflict” the other big festival promoters out there. chasinvictoria – The festival started small in 2009. Got bigger the next year. Then hibernated and then wisely came back four years later as a non-profit enterprise. We really like Big Ears; no matter how many performances we might immediately leave! You can almost tell from the venue whether you will like it or not. The Art Museum is usually safe, as are the big theaters. It’s the rock clubs that are dicey. Some places, like The Pilot Light, are obviously full of Rock Cooties.